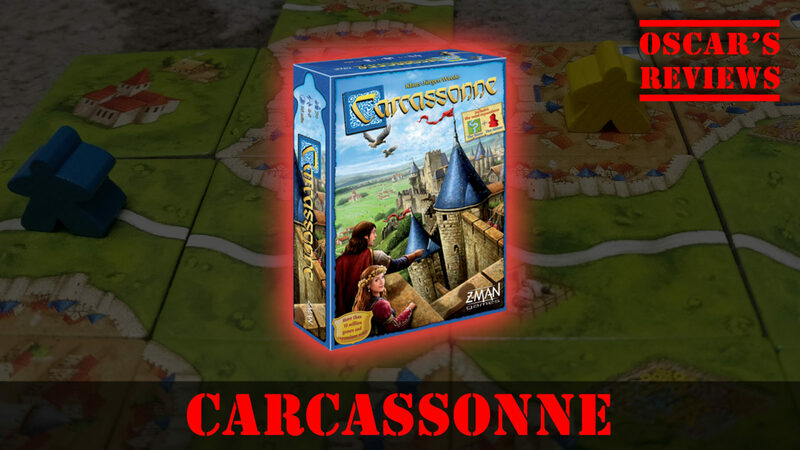 Carcassonne is a tile-based game where the aim is to score as many points as possible by building a city and placing your meeple in the best place to score points. 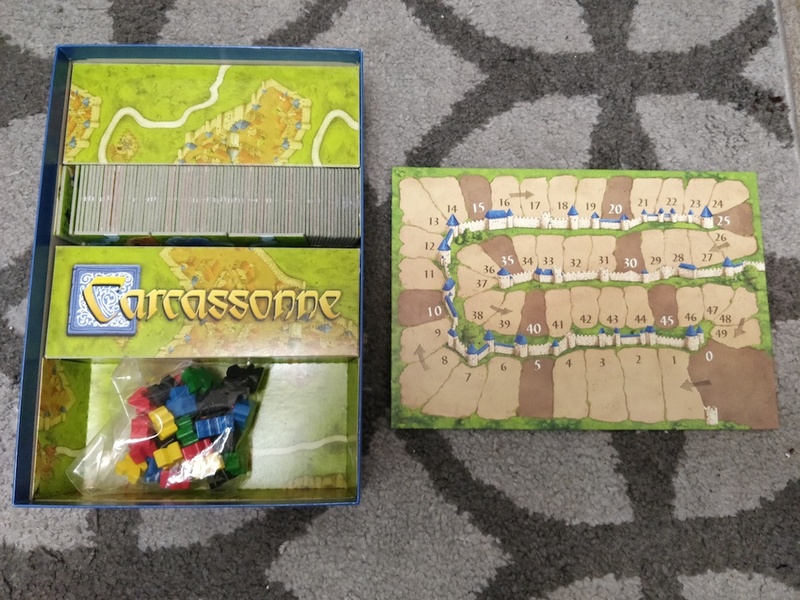 This special version of the game includes 2 mini expansions as well: “The River” and “The Abbot” – more on those later. The game consists of 84 square tiles with varying depictions of fields, paths, city walls and monasteries. Twelve of these are special ‘starter’ tiles which are darker on the back with a light ‘C’ to differentiate. 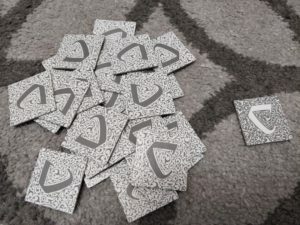 The tiles are a sturdy, heavy card and are designed so that each side of the square is either a path, a wall or a field. Only the same edge-types can touch i.e. you cannot have a path next to a wall, or a field next to a path – they must join together. A starter tile is placed and the remaining piles are placed face down in a few stacks. The first player must pick up one of the facedown tiles and place it onto the ‘map’ making sure it joins correctly. 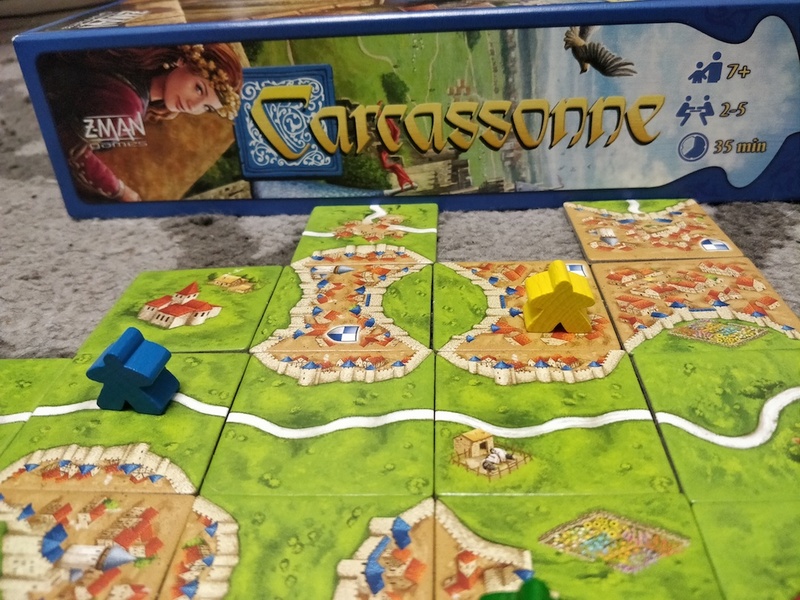 They can then place one of the meeples (little wooden figures) onto the tile that they have just placed and then, if appropriate, they collect their score. A meeple can be placed on a road (as a highwayman), in a city (as a knight) or in a monastery (as a monk). Only one meeple can be on each particular feature so if there is already a highwayman on a stretch of road (that can be across multiple tiles) then no one else can place one on that road. Points are scored in different ways depending on what feature has been used. Once a road has two ends (i.e. a junction at each end or a completed loop) then the player whose highwayman is on that road scores 1 point for each tile that makes up the length of the road. That player then moves their scoring meeple that number of spaces on the scoreboard and removes the meeple from the map. If a city wall is completed thus enclosing a full city then that player scores 2 points for each tile that makes up the city as well as 2 bonus points for each shield within the city. Again, the score is marked on the scoreboard and that meeple is removed from the map for the player to use again. Monasteries take longer to score points from but they are a nice high score. Once a monastery is surrounded by 8 tiles then that player scores 1 point per tile giving a total of 9 points. 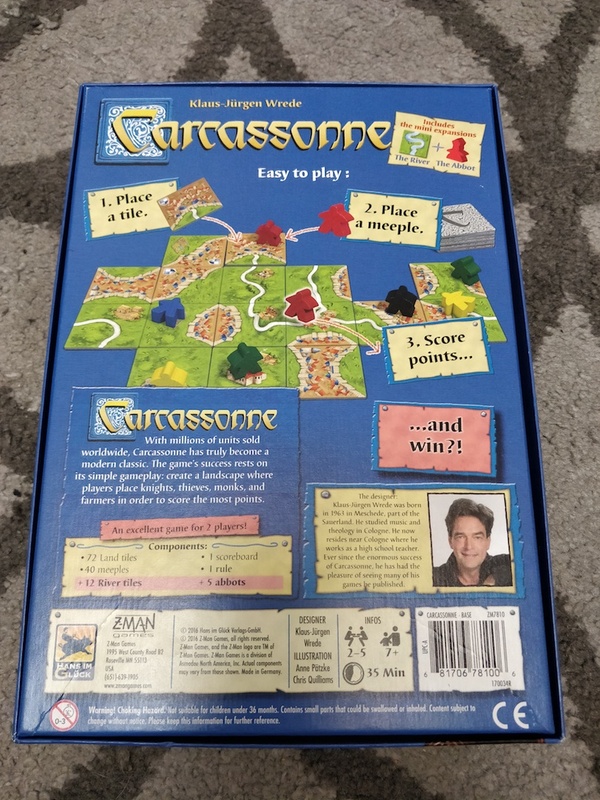 The score is marked and the meeple is returned to the player. Play continues until there are no more tiles to place. 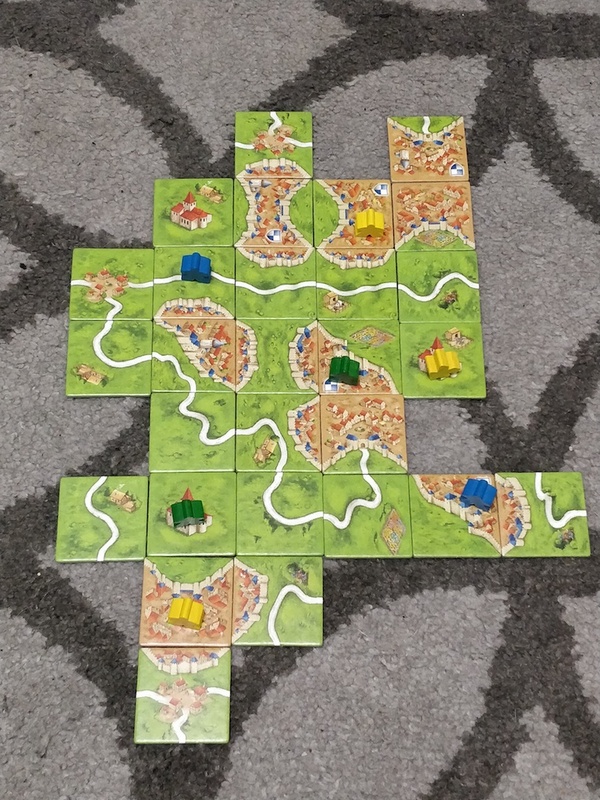 While there is a lot of luck involved with regards to which tiles you turn over, there is also a large element of planning and forethought involved in Carcassonne. If you start making a city too large then there may not be enough tiles to complete the wall. Or you may notice that a player is close to completing a city and decide to make their wall take an odd route that requires 1 specific tile pattern to complete. You also need to keep an eye on the monasteries to make sure you don’t give someone 9 points by accident. 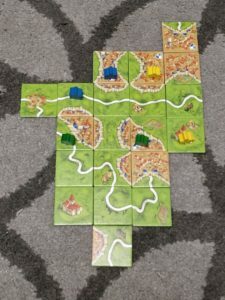 The game finishes when there are no more tiles and, with 72 tiles in play, it does mean you need quite a large area – the shape and size of this will depend which way players expand the map too. Basically, a kitchen table (or large floor space) would be ideal but you may struggle with a coffee table. After the final tile is placed there is a final chance to earn points. Incomplete features will score each player extra points. 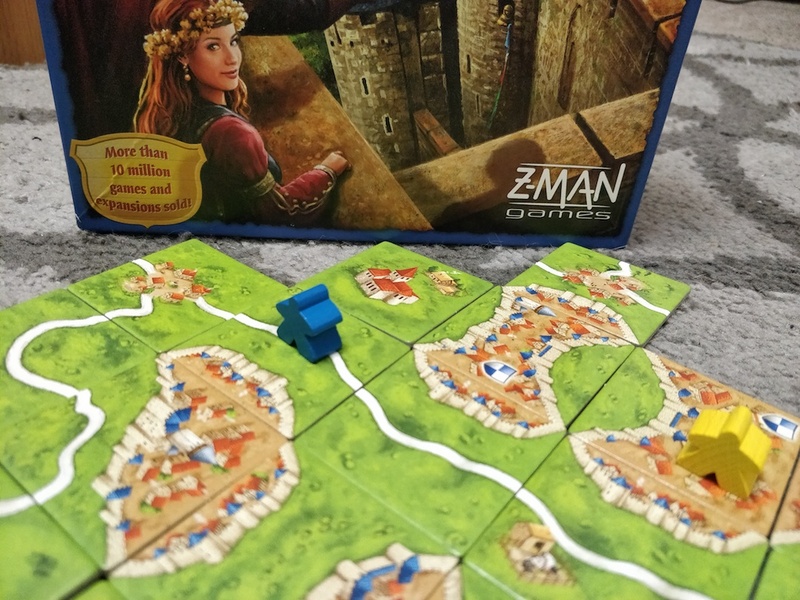 Each player gets 1 point for each tile in an incomplete road they have a meeple on; each player will get 1 point for each tile in an incomplete city which they occupy – along with an extra point per shield; and each monastery scores 1 point per monastery and 1 point per surrounding tile. The winner is the player with the most points. 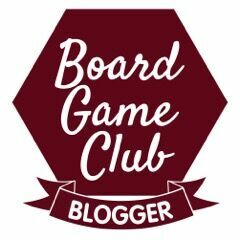 I mentioned earlier about the mini expansions: “The River” and “The Abbot”. The River gives you a slightly different start to the game as there are 12 dark-backed river tiles that must be placed before any of the normal tiles come into play. This means you start with a stretch of 12 tiles onto which players can start building up the map. The river doesn’t add anything directly to the game but it does mean players have a much wider choice for their tiles. The second expansion is “The Abbot” which gives players extra ways to score points. Abbots can be placed in monasteries or in gardens (these are on some tiles) and score the same as monasteries (9 points when the monastery or garden is fully surrounded). Each player only has 1 abbot so they can’t take over lots of gardens for extra points. 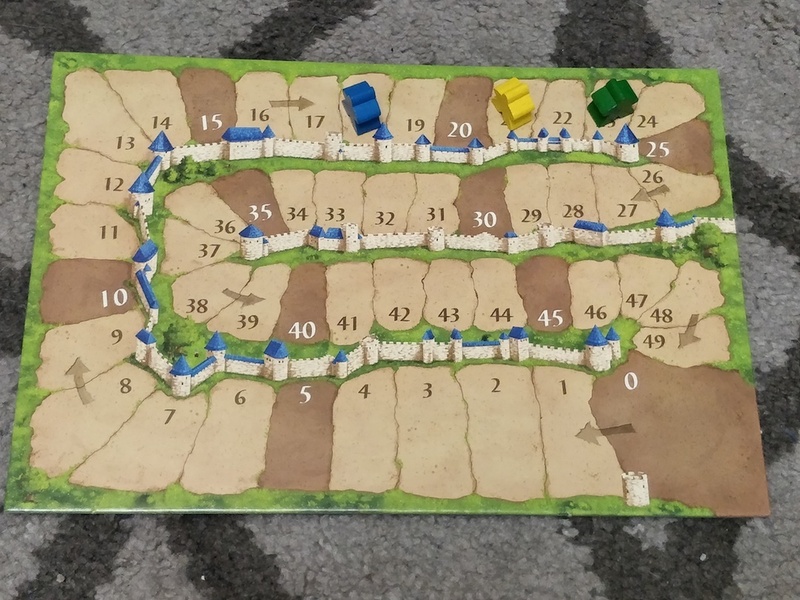 The abbot also has an extra way to score points – instead of placing a meeple, a player can, instead, remove their abbot from the map and score the current number of tiles surrounding their garden or monastery. Overall, Carcassonne is an easy game to learn but one where, due to the number and variation of tiles, there are a huge number of ways that the map can be made and grow. I’m not clever enough to do the maths for it but, in a nutshell, you’re not going to have the same game twice! 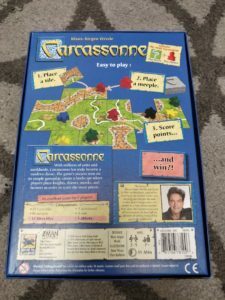 It’s also a great family game for players age 7 years and over and, with a reasonable price of £32.99 (although you can get it for as low as £25 if you shop around) then it’s not going to break the bank for the amount of play-time it will give you. 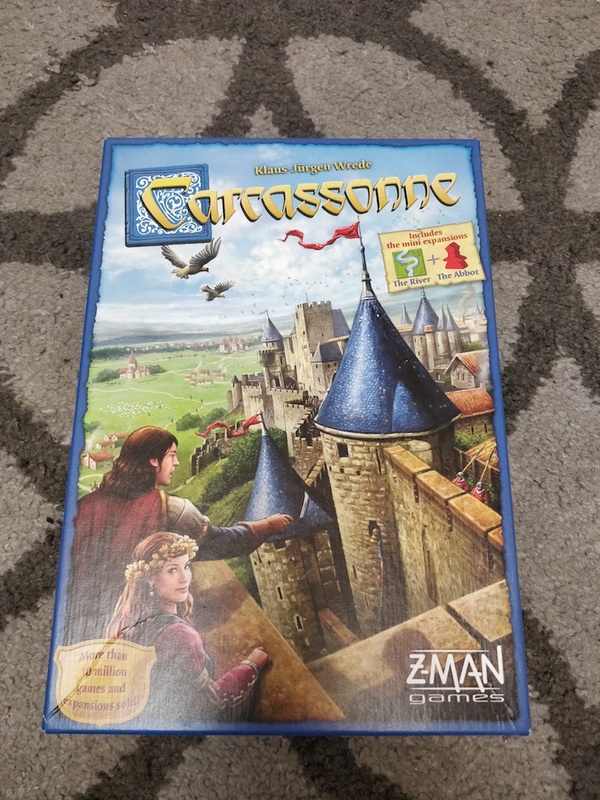 We highly recommend Carcassonne for any family that enjoys playing board games together. Disclaimer: We were given this game free of charge for the purpose of this review. All words and opinions are our own.